Inking is a great way to add the sense of dimension to your layouts without adding extra bulk. It is also useful for emphasising various features of your page. This layout shows how to put this easy technique to good use. This layout was created using three papers from the Sassafras Lass In Stitches collection (In Stitches Orange Paper, In Stitches Witty Paper and In Stitches Frolic Paper), orange Bazzil cardstock, dark brown ink, a brown pen, alphabet stamps and a cat button. Use your In Stitches Orange Paper for your background. Ink around the edges with dark brown ink. There is no need to ink the left edge as it will be covered up. Also ink a line down your page approximately 12cm from the left. Use a ruler to help keep it straight. Cut a strip of In Stitches Witty Paper approximately 12cm wide. Ink around the edges with dark brown ink. When dry, adhere down the left side of your page. Next, cut a rectangle of In Stitches Frolic Paper measuring approximately 17cm by 19cm. Lightly ink around the edges with dark brown ink and adhere towards the top right of your page, as shown in the layout above. Cut a strip of orange Bazzil cardstock measuring approximately 4cm by 16cm and lightly ink the edges with dark brown ink. Position vertically towards the bottom right of your page, as shown in the layout above. Also, cut a small triangle of orange Bazzil cardstock and lightly ink the edges with dark brown ink. Adhere behind the top left corner of your smaller photo so you can just see a thin orange outline. Position your smaller photo at an angle towards the top left of your page, as shown above. You may like to line it up so the top right corner of your photo is positioned exactly at the join between your In Stitches Witty Paper and your In Stitches Frolic Paper. Now adhere your larger photo towards the middle of your page. It should be straight, with the top right corner overlapping your smaller photo, as shown in the layout above. It should also overlap your strip of orange Bazzil. It is now time to focus on your embellishments. Begin by cutting a circle from your orange Bazzil. The diameter should be approximately 5.5cm. Ink the edges with dark brown ink and mat with In Stitches Witty Paper. Again, ink the edges with dark brown ink. Cut a monogram (in this case, the letter B) from the In Stitches Witty Paper and ink the edges. When dry, adhere to the centre of your circle. Adhere the circle at the bottom right corner of your large photo, as shown in the layout above. Cut a strip of In Stitches Frolic Paper approximately 18.5cm by 1.5cm. Lightly ink the edges and adhere along the bottom right of your page. Cut three small rectangles from In Stitches Witty Paper and lightly ink the edges. Layer them on top of each other in the bottom right corner and adhere. 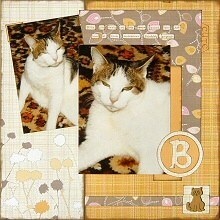 Place an embellishment (in this case, a cat button) on top of the layered rectangles. Cut small rectangles of In Stitches Witty Paper, one for each word of your journaling. Use your brown pen to journal one word on each piece. Lightly ink the edges of each piece with dark brown ink and arrange across the top of you page, as shown in the layout above. Finally, cut a small tab from orange Bazzil. Lightly ink the edges with dark brown ink and use alphabet stamps to stamp a word on the tag (in this case, CUTE). Position the tab towards the top right of your page and you're done!